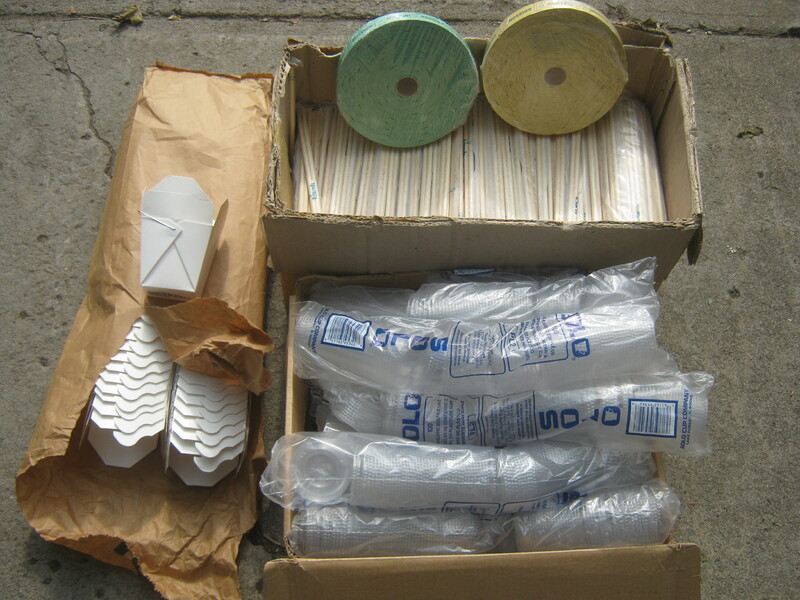 I pulled these restaurant supplies out of the recycling at the storage unit. We have a box full of individually wrapped chopsticks, another box full of solo lids (PL-2), and three bags full of little take-out containers – the kind they give you when you get noodles to go. There’s also a couple rolls of draw tickets. I don’t really have a use for any of this stuff, I just thought it was a bit of a waste for it all to be thrown out as none of this stuff, except for maybe the lids, is actually recyclable. Nothing has even been opened (though the papers bags of the take-out containers have ripped a bit). If anyone has a use for it just send me an email at thingsifindinthegarbage@gmail.com and maybe we could work out a deal! I haven’t done much research but I do know a full case of these lids goes for around 50$ plus shipping online, however I’d definitely give a much better deal on the local market. I’m open to cash or trades for micro-brew beer. I realized yesterday that I still feel pretty exhausted and sore from all the moving of the past few days. I didn’t make it out to look for trash yesterday and doubt I’ll have the time or energy to do it today. Still, maybe I’ll come across something cool in the storage trash when I go there for work this afternoon. I’ll keep you posted. Phase 1 of moving is complete. The old apartment is empty and clean and the keys have been returned. Most of my stuff is at the new place. However, I can’t move into the room until the 1st so I have a few days of staying at a friend’s place ahead of me before I can begin Phase 2 (unpacking and organizing). For now, I’m happy to just relax after an extremely hectic few days. My new place is on Van Horne near Parc. This change in location will definitely have an effect on which trash “routes” I’ll explore. It’ll mean more Outremont, more Park Ex, and maybe even some trips up to Cote-des-Neiges. It’ll mean less of the eastern Rosemont and Plateau routes. I’m excited to get to know these new neighbourhoods a little bit better. I might even have a bit of time for the hunt in the next couple of days. My work schedule is pretty light for the moment, though apparently it will be pretty busy again starting Sunday. I took a little walk around Outremont (which is near where I’m staying) this morning and found an old wood bat by St Mary’s (from Hespeler ON). I drove by a pile of trash on Tuesday which sat next a small apartment building on Laurier and Resther and felt the need to take a closer look. 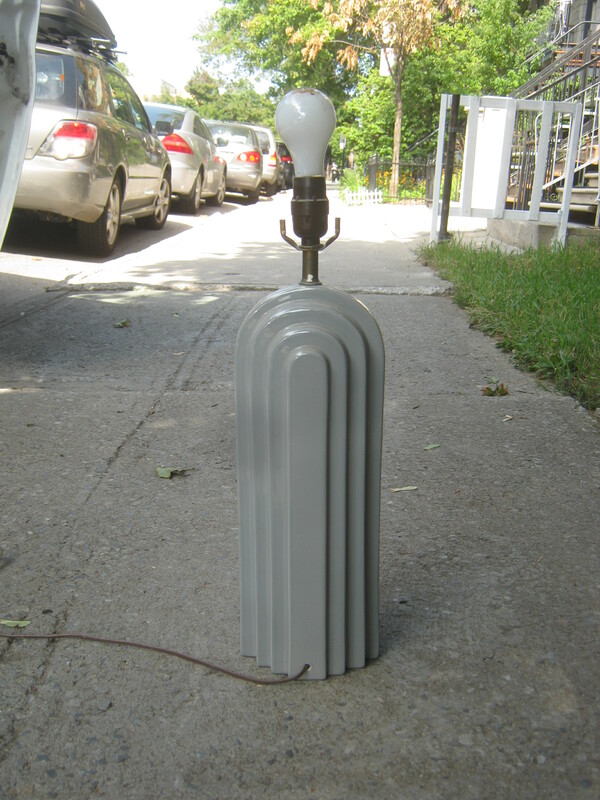 Inside one of the trash bins was this lamp. It looks like an old art deco piece. It’s fairly tall, I’m guessing around two feet high. It was super dusty when I found it so I think it might have been stored away for a while, perhaps in one of those little lockers they often have in apartment buildings. I haven’t tested it yet, though even if it doesn’t work lamps are fairly easy to fix. There’s a small chip near the bottom on the back but it’s the kind of thing you can hide pretty easily. Like a lot of art deco stuff it needs a light-shade and spot that matches its unique style. Still, I think it’s pretty cool! In lieu of more contemporary stuff to post I figured I’d show you one of my favourite all-time storage dumpster finds. 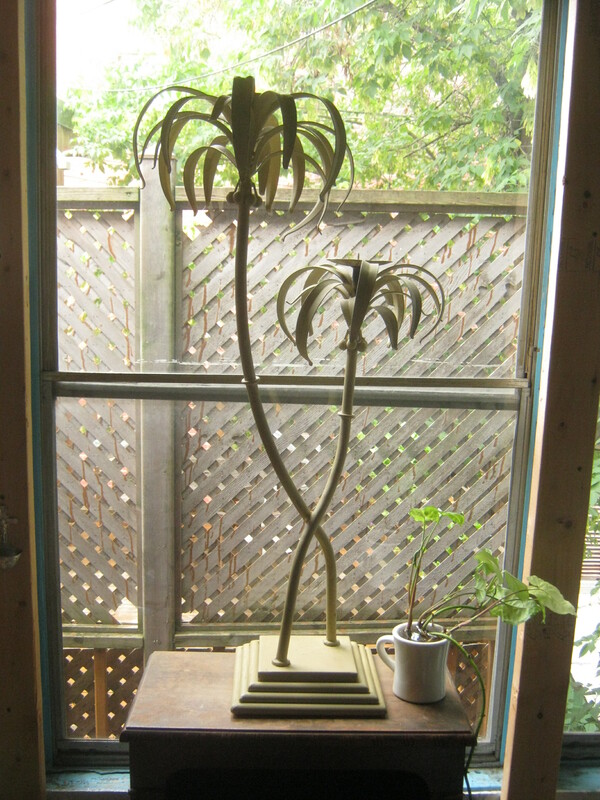 It’s a cool palm tree candelabra which stands around three feet heigh. I found it a few years back when I first began this regular “seasonal” temp job. I always liked it a lot and have been using it as a decoration ever since. My mom came to town a couple of months ago and noticed it while looking through some of my other finds. She told me it was actually fairly old and guessed that it was made in the 1940s. For whatever reason I never really considered its age but it does indeed have the look and feel of a “vintage” piece. It’s fairly heavy and made of metal – two common signs that something is vintage. She said I should hold onto it. I definitely will as it’s one of my favourite decorations regardless of how old it may be. I remember another thing I wish I could show you – a little book of fabric tables to be used by workers of some factory in Navan, Ireland. I think it was published in 1840. I found it around the same time as the candelabra and sold it at a yard sale close to two years ago for a measly dollar. I wish I could have it back now! I’m sure if I had it today I could get a bit more than what I got back then. Hopefully more storage finds will present themselves in the coming days. 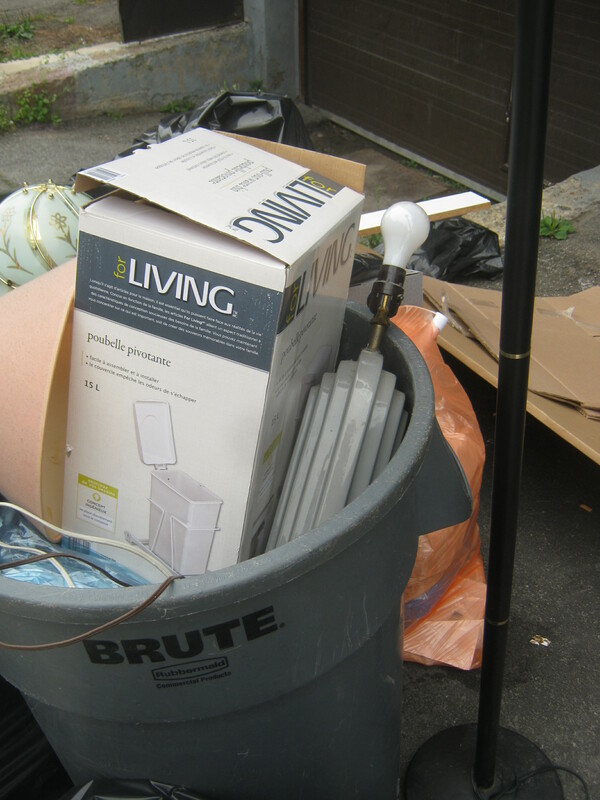 It’s nearing the end of the month so perhaps people will be motivated to empty their units to avoid another month of fees.